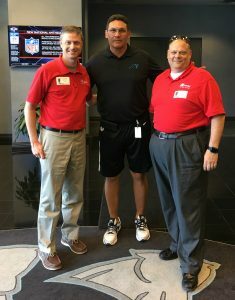 As part of the MADD/NFL partnership, MADD SC staff and volunteers spoke to the newest group of Carolina Panthers rookies in May during their rookie camp. 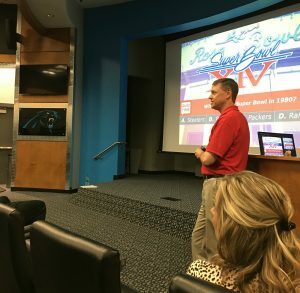 MADD staff Steven Burritt and Chris Phillips talked about MADD’s mission, DUI in the Carolinas, and the impact a DUI arrest can have on an NFL career and in the court system. Kayla Cox of Rock Hill gave her heartfelt story of losing her husband Daniel in a one-car drunk driving crash less than two years ago. 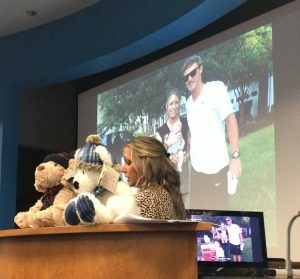 Her presentation took the players through Daniel’s life until the night that left his two children without their father. The players were respectful and listened attentively. We wish them all the best in making an NFL roster and thank the Panthers for being great hosts and including MADD for giving their new players some valuable life lessons to keep themselves and others safe.